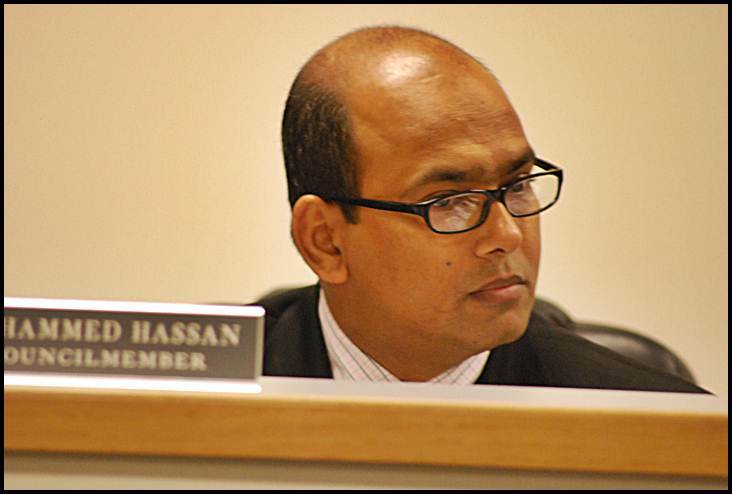 City Councilmember Mohammed Hassan has had trouble keeping up with his water bills for the past year, and even failed to make good on two payment plans he signed with the city. But now, he’s all caught up. It took a year, but City Councilmember Mohammed Hassan has finally caught up with his water bills. Last July in 2013, shortly after Emergency Manager Cathy Square came on board, the city started a crackdown on overdue water bills – something Detroit is just now tackling. Square ordered shutoffs to those who had been long overdue. Included in that list of shutoffs was Hassan, who owed almost $1,600. In August of that year he signed an agreement with the city to immediately pay $800 and a balance of $758 two weeks later. He never made that payment. A look at his water bills, for his residence at 2425 Neibel, shows a long struggle to make good on not only that agreement but also just to keep current on his bills owed for service. The Review recently obtained Hassan’s water bill record through a Freedom of Information Act request. As of June 23 of this year, Hassan was still behind by $497. According to the city, Hassan paid his overdue amount on July 18, four days after The Review filed its Freedom of Information Act request for his water billing history starting back from the beginning of 2013. Like many people in the city, Hassan’s water bill grew and grew since January of 2013. By July 16, 2013 he owed $1,532, and he paid with a check for $588. However, that check bounced and he was fined $26. The bill continued to increase to $2,038, which he knocked down to $1,238 on Aug. 8, 2013. There were subsequent penalty fees for late-payments. Hassan entered another agreement in October, where he paid $731 and promised to pay the $631 balance by Nov. 23, 2013. Although Hassan paid $630 on Nov. 22, he still owed the city an additional $584 that accrued since the October payment plan with the city. In the months to follow Hassan made monthly payments, but he was always behind. Until, as mentioned, July 18, a week ago. In the past, Hassan has run for office on fiscal accountability. He is now running for State Representative. Things could have gone worse for Hassan. The city charter says that any elected official who owes money to the city or any other government agency is considered a “defaulter” and can be kicked out of office. Square declined to pursue the matter last year, saying she wanted to avoid a possible costly legal battle.